It is interesting to learn about emotional intelligence from others. In the process of conducting emotional intelligence workshops for PMs over the last 5 months, I have found that I learn new things during each session. 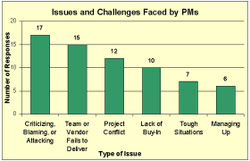 I am particularly interested in the top emotional intelligence issues and challenges that PMs face. Identify the issues, breakdowns, or major problems that you experience in the workplace that you believe are related to emotional intelligence or may be helped by this workshop. I have been reviewing the collected data from various angles and using it to develop new exercises and approaches to help the workshop participants. Here is a chart with a summary of the issues from the last two workshops (click to enlarge). One important thing to note about the chart; even though I included one category for project conflict, most (if not all) of the issues could have been considered ‘project conflict’. I wanted to avoid having one large category so where possible I tried to separate into other categories that would make more sense. If you would like to see all the data, click here to download a PDF of all the responses. I would love to hear your feedback and comments. What are the biggest issues, challenges, breakdowns or problems that you face at work? Do you agree with the ones that are shown?